A plan by New Orleans Mayor LaToya Cantrell to ask state lawmakers to shift some hotel taxes from tourism to the ailing infrastructure of the Sewerage & Water Board was dealt a major, and likely fatal, blow on Tuesday when Gov. John Bel Edwards came out against the idea. Edwards panned the nascent proposal, which Cantrell was expected to push in next year’s legislative session, at an event held by the Bureau of Governmental Research, saying he was “not at all interested” in trimming the tax dollars the Ernest N. Morial Convention Center, the Mercedes-Benz Superdome and local tourism groups now receive. Without that money, “we’re not going to make the improvements we need to make,” Edwards said, arguing that improvements to those key facilities are particularly important as the city prepares to host the 2024 Super Bowl. “We kid ourselves if we think we don’t have to continue to invest in those buildings and make them more modern and increase the revenue-generating capacity of those buildings,” Edwards said. The taxes are also needed to pay off the buildings’ outstanding bonds, he said. Cantrell’s plan was already on shaky ground, with the powerful state Senate President John Alario, R-Westwego, announcing he opposed the idea shortly after she first discussed it. For years, New Orleans officials have eyed the millions of dollars in hotel taxes that go to hospitality and sports groups as a potential source of money for city projects. 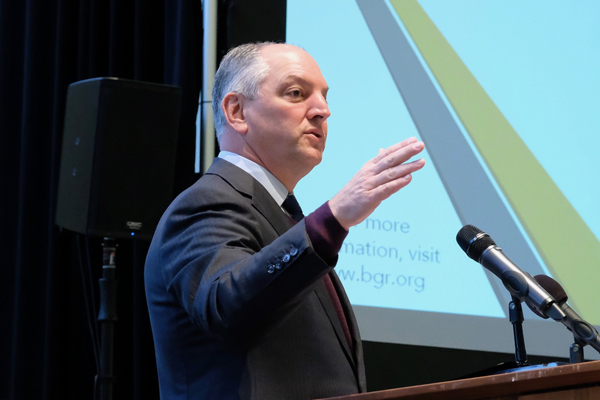 BGR, the same group that hosted Edwards on Tuesday, has long argued that money that now goes to the Ernest N. Morial Exhibition Hall Authority, the Louisiana Stadium and Exposition District, New Orleans and Co. and the New Orleans Tourism Marketing Corp. could be better spent on more pressing needs. In a report, BGR found those groups got about three quarters of the $165.8 million that hotel and related taxes brought in during 2015, while the city received only about 11 percent. The rest of the money was divided among other agencies. In September, Cantrell sketched out the idea of shifting some of those funds away from tourism to help finance an overhaul of the S&WB’s drainage system. The widespread problems with pumps, power turbines and pipes in that system have been on full display since last summer’s flooding, and the comprehensive upgrades officials say are needed would cost hundreds of millions — if not billions — of dollars. Edwards also voiced support Tuesday for plans to build a 1,200-room hotel next to the Convention Center, arguing it would be an asset to the giant meeting hall. However, he avoided weighing in directly on the $330 million in public money developers are seeking for the $557.5 million project, a request Cantrell has opposed and BGR has questioned.